NAMI's location on the 24th floor also grants impressive views of the city. 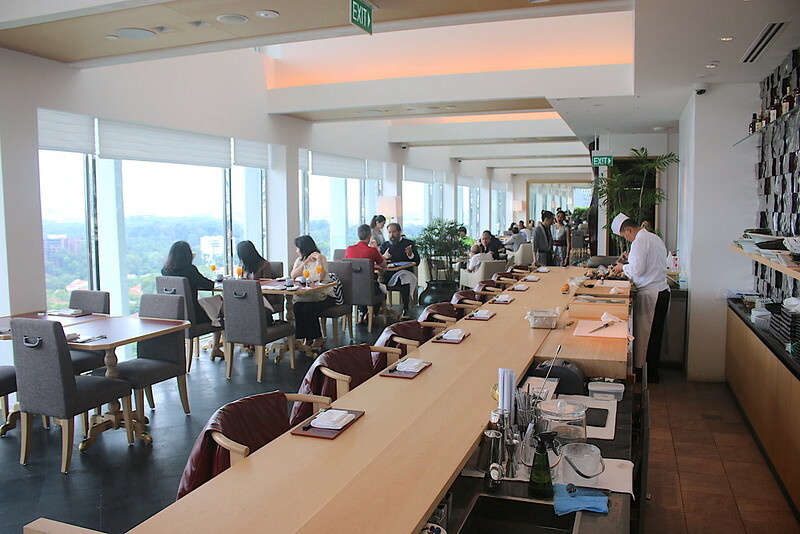 The restaurant is bathed in natural light from the floor to ceiling windows on one side. The modern eatery is designed by Japan-based Bond Design Studio, the same firm that conceptualised the look of the new Tower Wing of Shangri-La Hotel, Singapore. Designer Ryoichi Niwata created a space that incorporates the refined elegance and simplicity of Japanese design aesthetic with the five key elements of stone, wood, water, trees and wind, which he features in the overall design for the new tower. There's a beautiful long counter where you can sit and watch the chefs work. Or you could choose a window-side table and take in the views of the lush greenery surrounding Shangri-La below. We start lunch with an appetiser of whitebait with tsuru murasaki or Malabar spinach (see bottom right of first photo). 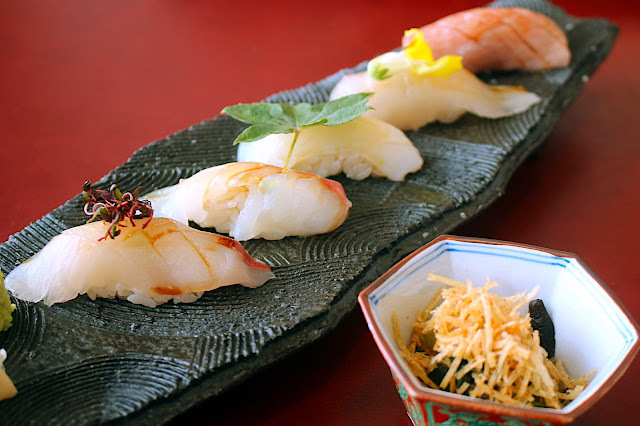 The fish is certainly fresh; it's flown four times a week from Japan, mainly Tsukiji but also from Kyushu and Hokkaido – thanks to suppliers with whom Chef Akiba has built relationships with for over 30 years. 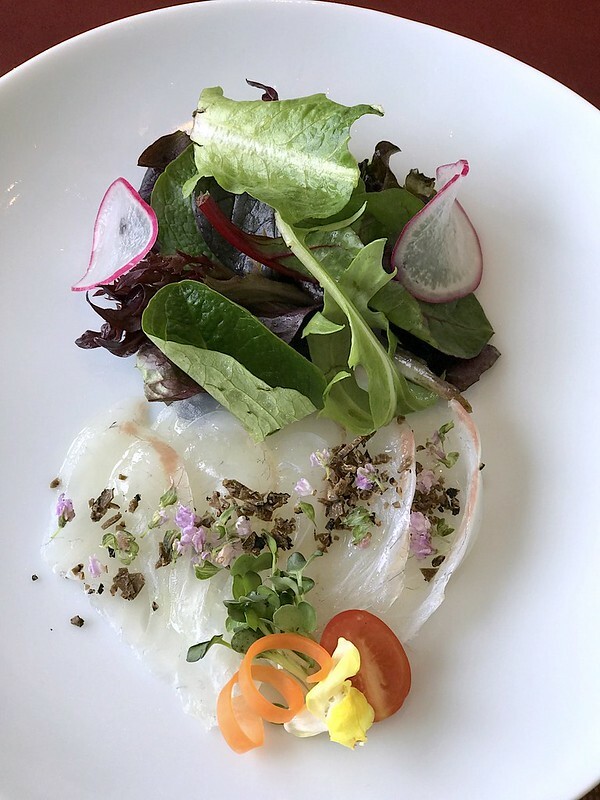 Delicate slices of sashimi adorn this Western-style plate of greens. We also had a seasonal soup. 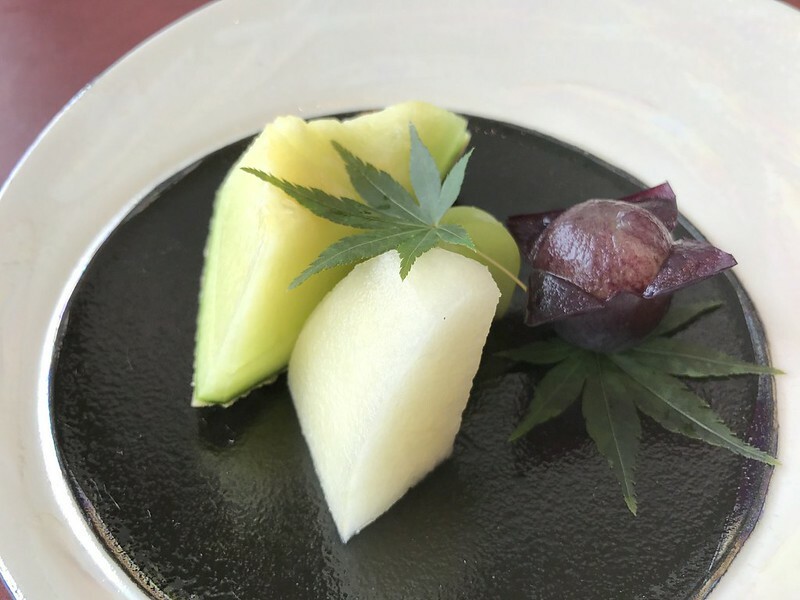 Wintermelon from Aichi is blended with yuzu kosho into a creamy veloute. I love yuzu kosho; it's got to be one of the best condiments ever with green peppers and yuzu peel cured with salt. This is one of their signature dishes not to be missed. The pen shell clam or fan mussel is one of the largest bivalves in the world. The meat tastes like a cross between clam and scallop. 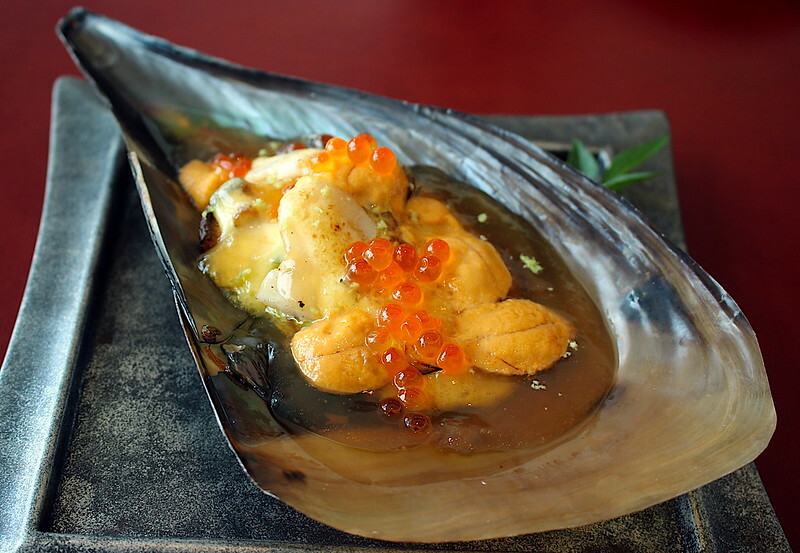 Here it's prepared with "bekko sauce" (essentially bechamel sauce), miso, soy and vinegar, topped with uni and ikura, and served on the fan-shaped shell itself. 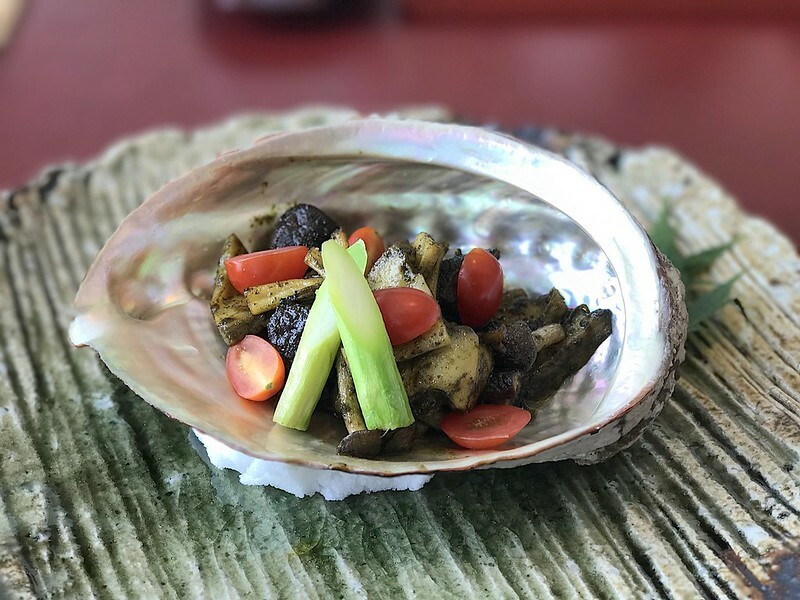 Abalone in liver sauce? Yes, if you like both. I'm not a fan of liver, but fortunately the sauce was not overpowering. 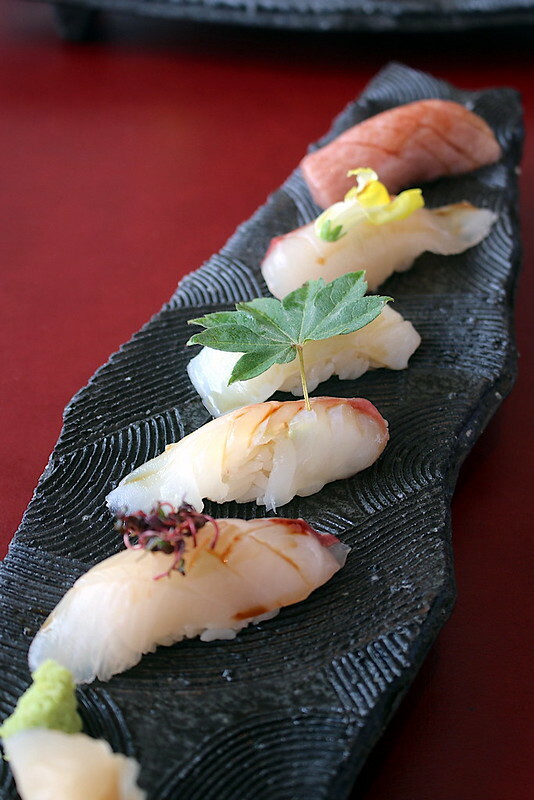 Chef Akiba is a dashi master and the dashi at NAMI is made using the best kombu and katsuobushi. 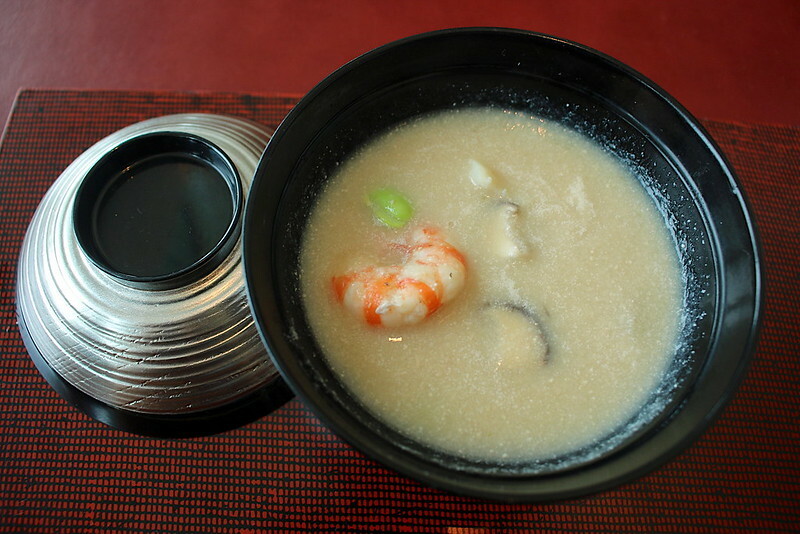 The former is sourced from the sea off northern Hokkaido, favoured for its sweet, deep, rich, savoury yet clear stock. The latter is from Kyushu, from a producer, Marufuji, that is so fastidious it only selects one piece out of 10,000 to be fermented and aged. 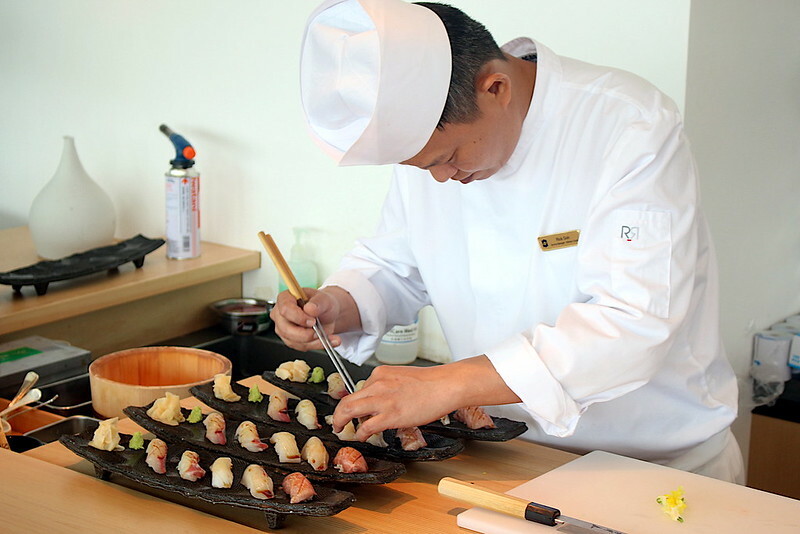 The result is a more complex, sweeter flavour, intense fragrance and increased umami. The beef in the broth is as lovely as you can expect. 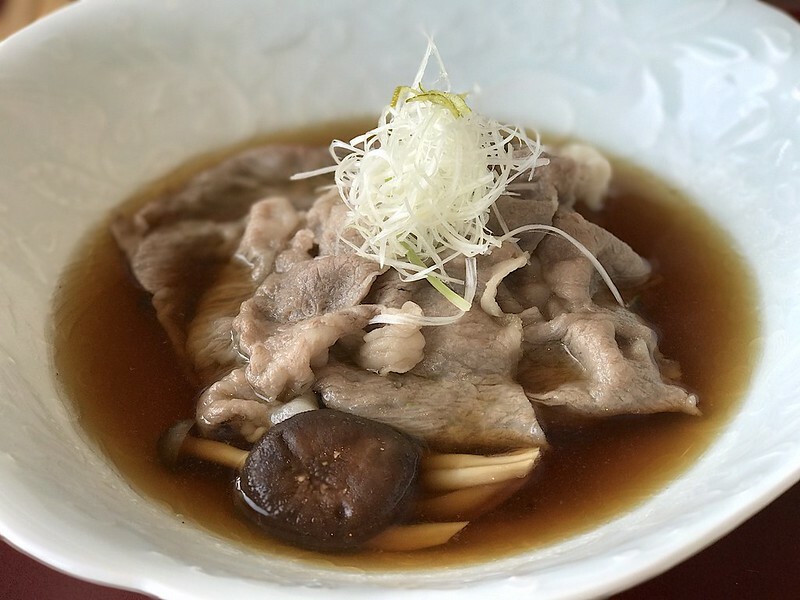 Tender and fatty but not overly oily, the A4 wagyu shines through with the superior dashi adding umami enhancement. Few things can be as simple and refreshing as good produce served as it is, sans cooking. 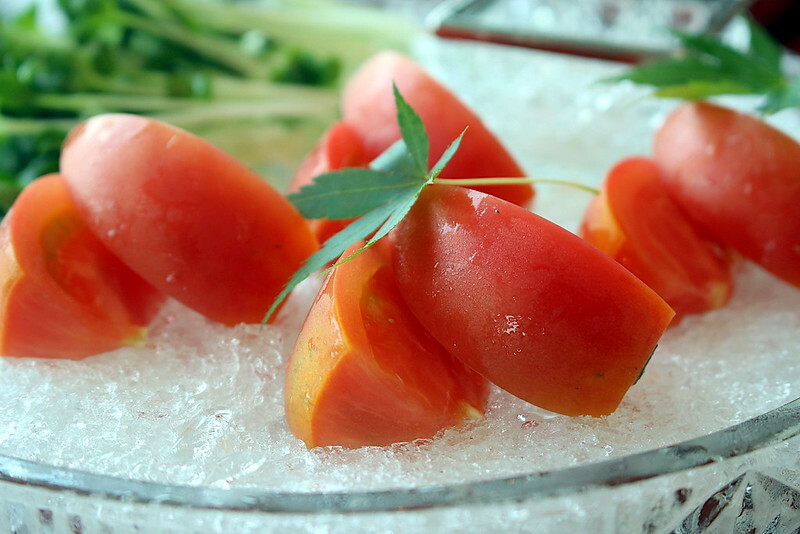 This is where tomato truly deserves its definition as a fruit - sweet, juicy and invigorating. They have various types of Japanese fruit too. Here we have crown melon from Shizuoka, Yamanashi pear, muscat and Kyoho grape. NAMI also has a great selection of sake. This Bon chogin daiginjyo sake goes for S$1,000 a bottle and several have been snapped up already. The name Bon means "unstained purity," and sake from this 1860 brewery is entirely junmai (no added sugars or alcohol). It's used in government ceremonies, such as the celebratory sake during the enthronement of Emperor Showa. 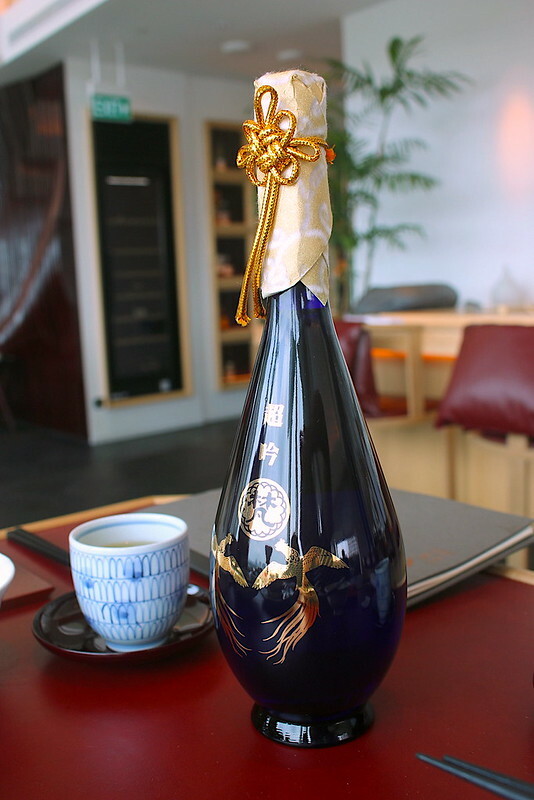 Former Prime Minister Yukio Hatoyama famously gifted a bottle of Bon Chogin to President Obama. On a lighter note, you have the Aragoshi sakes. These are sake based wines delightfully rich in pulp. 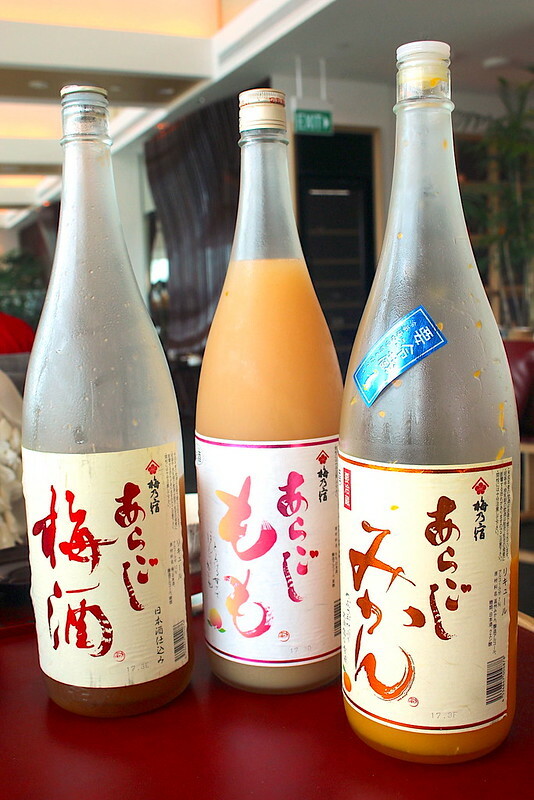 “Aragoshi” means “to roughly mash.” For example, the Ume Aragoshi has plum fruits pureed into the matured umeshu. The natural pulp gives a pleasant nigori-like (cloudy) texture. These are absolutely divine chilled. 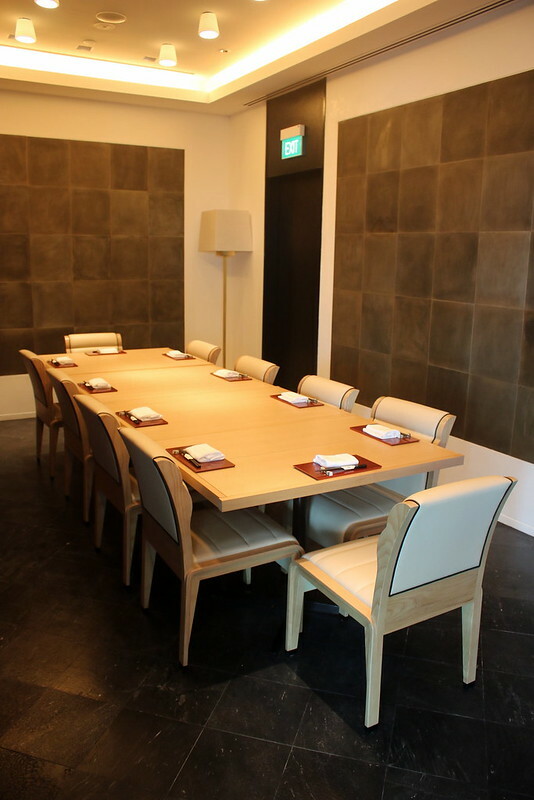 If you're looking to entertain privately, NAMI also has two private dining rooms, seating six and 10 respectively. Multicourse lunch menus at NAMI go from S$45 for the vegetarian course to S$110 for Chef Akiba’s Lunch Course (Amuse-bouche, appetiser, soup, assorted sashimi, stewed dish, main dish [choice of beef or fish], rice, miso soup, dessert). Set lunches start from S$45 and include choices like Australian Angus Beef Komiyaki/Sukiyaki/Steak-jyu, Tempura, Tenjyu, and Katsu-don. 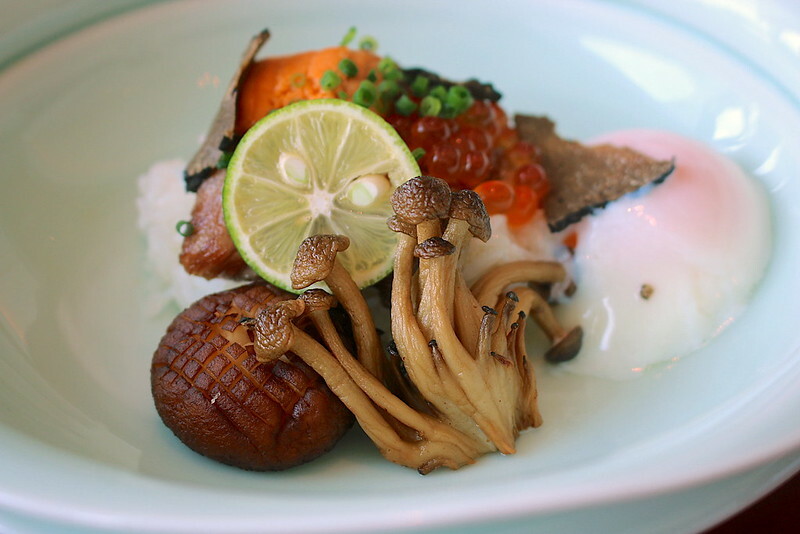 There's Kaisen-don, Sashimi, Sushi, Tekka-don (tuna) and Salmon & Ikura bowls from S$50-55 too.